If a watch with a simple date function sounds a little too common, up your game with an annual or a perpetual calendar timepiece. Here’s a quick guide on the difference between the two. The simplest form of calendar on a watch is the date displayed via an aperture. Sometimes the watchmakers create larger-than-usual window – hence the term “big date” – for better readability. Slightly more interesting is a date indicator in the form of a hand pointing to a date track, usually in a sub-dial but occasionally the periphery of the main dial. And sometimes there is the addition of the moon phase, a complication tracking the lunar cycle that lends the simple date a touch a whimsy. Find out what makes a mechanical and a quartz watch tick. The above white gold Saxonia Moon Phase with a black dial from A. Lange & Sohne, for instance, features an oversized date counter at ‘12’ and a seconds sub-dial at ‘6’ with its upper crescent revealing the moon phase. Meanwhile, the Oris Big Crown Pointer Date has a central hand with a red tip that points to the dates positioned around the periphery of the dial. More detailed calendar watches can be found in the annual and perpetual calendar. Both feature not just the date but also the day and the month. Occasionally, the year is thrown into the mix to show off extra watchmaking muscle. The main difference between the two is obvious from the names themselves. The annual calendar requires an adjustment once a year, on March 1 to correct against the shortest month of the year, February. The perpetual calendar, however, requires only one adjustment in 100 years as it is calibrated to correct itself automatically for months shorter than 31 days, including the leap years. The next time a perpetual calendar watch needs to be corrected is the year 2100. One of the best-looking annual calendars this year is the IWC Schaffhausen Big Pilot’s Watch Annual Calendar Edition “150 Years”, the only one in its extensive Jubilee Collection to feature this complication. The in-house calibre 52850 with Pellaton winding system operates what is known as the American display of the month, date and day via three separate windows at ‘12’. When it comes to crafting exquisite calendar watches, Vacheron Constantin has very few equals. Last year’s Cabinotiers Celestia Astronomical Grand Complication 3600 was a jaw-dropping piece featuring 23 complications to include the seasons and zodiac signs besides the perpetual calendar. 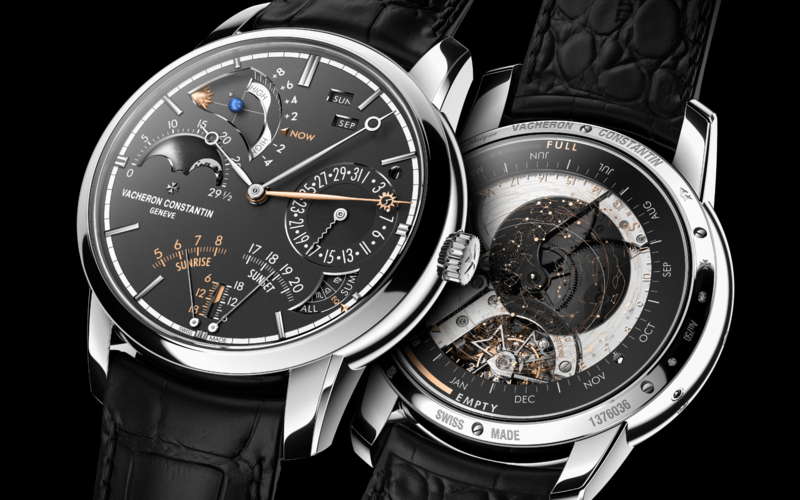 Vacheron Constantin's new ultra-thin Overseas features a more typical perpetual calendar display via four sub-dials – the month at ‘12’, the date at ‘3’, the day at ‘9’ and the moon phase at ‘6’. Despite the technical complexity, the automatic movement is composed of only 276 parts and measures only 4.05mm in thickness.